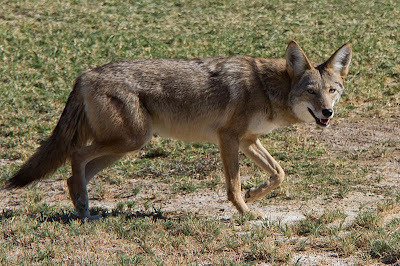 Coyote Canis latrans, photographed by Dawn Beattie. The genus Canis includes the true dogs, wolves and jackals; they are relatively large and often highly social canids. Members of this genus are found in Eurasia, Africa and North America, with the dingo Canis dingo also prehistorically introduced to Australia. The domestic dog Canis familiaris and dingo C. dingo are both derivatives of the grey wolf C. lupus modified by association with humans, and are often treated as subspecies of the latter. See also: Wolf and wolf and wolf and wolf and cub; The wolf in time. [GSD74] Gipson, P. S., J. A. Sealander & J. E. Dunn. 1974. The taxonomic status of wild Canis in Arkansas. Systematic Zoology 23 (1): 1–11. [H84] Harrington, F. H. 1984. Wolves. In: Macdonald, D. (ed.) All the World’s Animals: Carnivores pp. 50–51. Torstar Books Inc.: New York. [Ma84] Macdonald, D. W. 1984. Other dogs. In: Macdonald, D. (ed.) All the World’s Animals: Carnivores pp. 76–77. Torstar Books Inc.: New York. [M06] Mech, L. D. 2006. Age-related body mass and reproductive measurements of gray wolves in Minnesota. Journal of Mammalogy 87 (1): 80–84. [Mo84] Moehlman, P. D. 1984. Jackals. In: Macdonald, D. (ed.) All the World’s Animals: Carnivores pp. 56–59. Torstar Books Inc.: New York. [R64] Ride, W. D. L. 1964. A list of mammals described from Australia between the years 1933 and 1963 (comprising newly proposed names and additions to the Australian faunal list). Australian Mammal Society Bulletin 7 (Suppl. ): 1–15.